Gorham Savings Bank granted 20 wishes in July and August totaling $20,000 as part of its 150th anniversary Wish Tree program. “With a goal of granting $150,000 worth of wishes in 150 days, the first and second round of wishes fulfilled included snow plow service this winter for a working single mother in Waterboro, plane tickets to Alaska for parents to visit their son returning from deployment in Afghanistan, assistance with college tuition for a 23-year-old cancer survivor who cares for her little brothers, and contribution towards a prosthetic leg for a child in need,” the bank said in a press release. Other wishes granted included a donation to the Windham Veterans Association, a field trip for the incoming grades 4 and 5 classes at East End Community School, heating oil for hard-working parents of six children in Portland, and a donation to the Gorham Backpack Program for children with food insecurity. Also, thanks to the Wish Tree program, Gorham Cooperative Preschool will celebrate its 50th anniversary with a new outdoor playset, American Legion Post 197 received a donation for building upgrades, and the Gorham Volunteers in Police Service (VIPS) received a donation towards medical supplies. Presumpscot Regional Land Trust’s annual meeting and a trail opening is set for 5 p.m. on Sunday, Sept. 16, at Randall Orchards in Standish. Registration is required. For more information or to register, visit www.prlt.org. Darryl Wright, chairman of the School Committee, announced at last week’s Town Council meeting that the unofficial total school enrollment is 2,788. The enrollment is up from 2,724, according to School Department figures last spring and has been projected to hit 2,801 in 2019. The current enrollment for Gorham High School is 870; middle school, 629; and the three kindergarten through grade 5 schools, 1,289. Wright told town councilors last week that the numbers are preliminary and would change. The American Red Cross will conduct a blood donation drive from 10 a.m.-4 p.m. on Friday, Sept. 21, at Sebago Brewing Company, 616 Main St., Gorham. “The American Red Cross urges people of all races and ethnicities to give blood to help ensure a a diverse blood supply for all patients in need,” the agency said in a press release. For more information or to make an appointment, visit RedCrossBlood.org or call 1-800-733-2767. The first fall meeting of Potluck With a Purpose at 6:30 p.m. on Friday, Sept. 21, at Summit Community Church, 53 County Road, Gorham, will highlight an anti-trafficking initiative launched by an Oregon-based organization, In Our Backyard. Those attending are asked to take food to share. The Bureau of the Fiscal Service reported on Sept.6 that the U.S. public debt was $21,454,589,882,352.10. 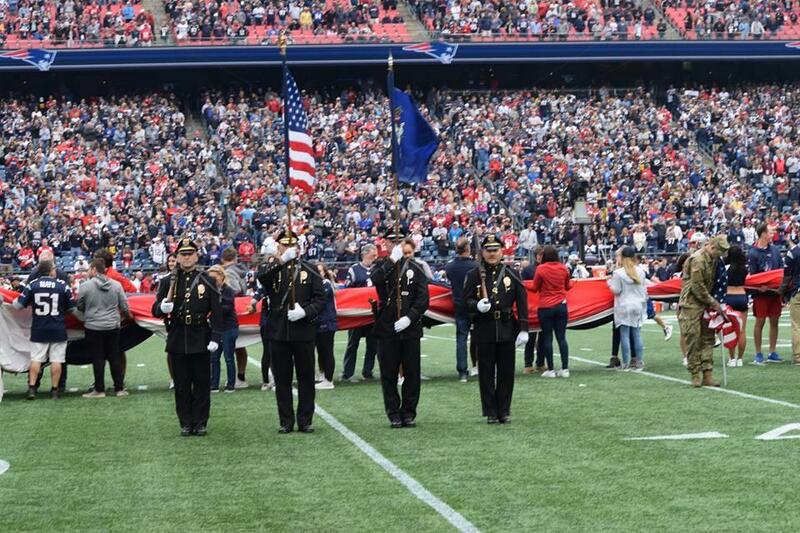 The Gorham Police Department color guard participates in opening ceremonies Sunday as the New England Patriots kicked off their 2018 season at Gillette Stadium in Foxborough, Massachusetts.